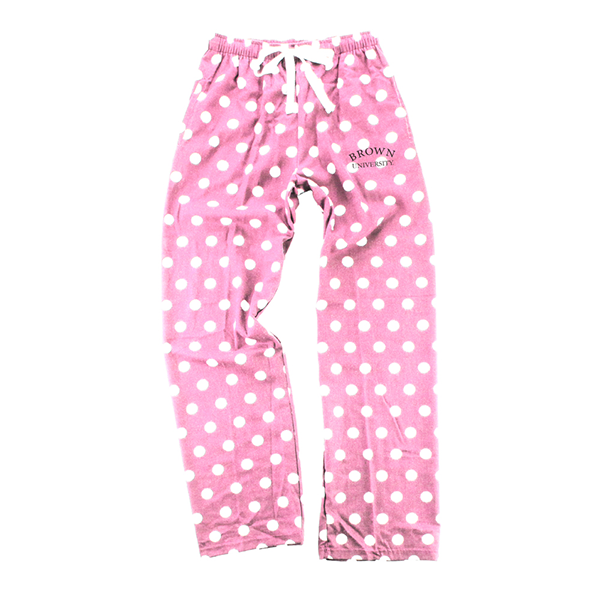 Please select option for Boxercraft Flannel Pink Dot Pants - $29.95. 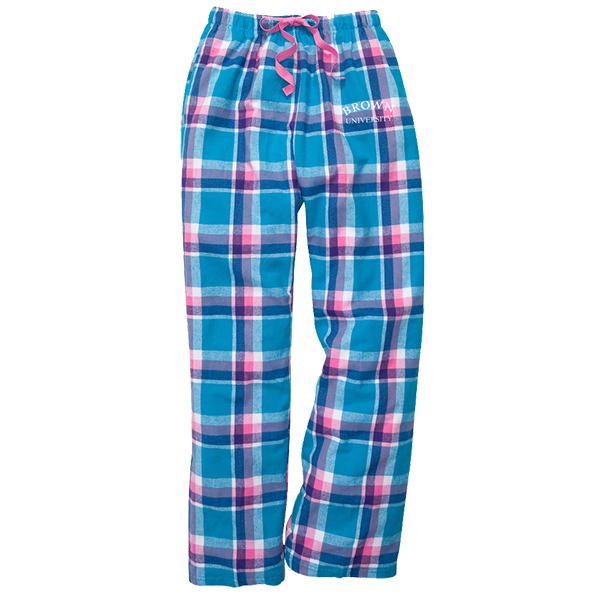 Please select option for Boxercraft Plaid Flannel Pants - Blue & Pink - $29.95. 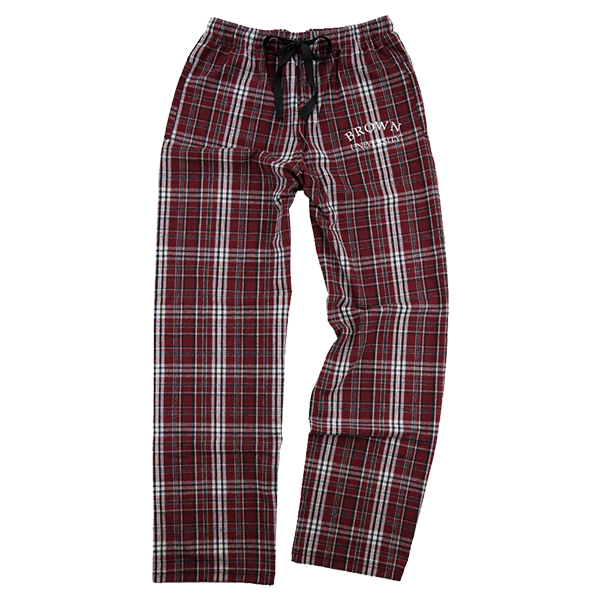 Please select option for Boxercraft Plaid Flannel Pants - Maroon & Black - $29.95. 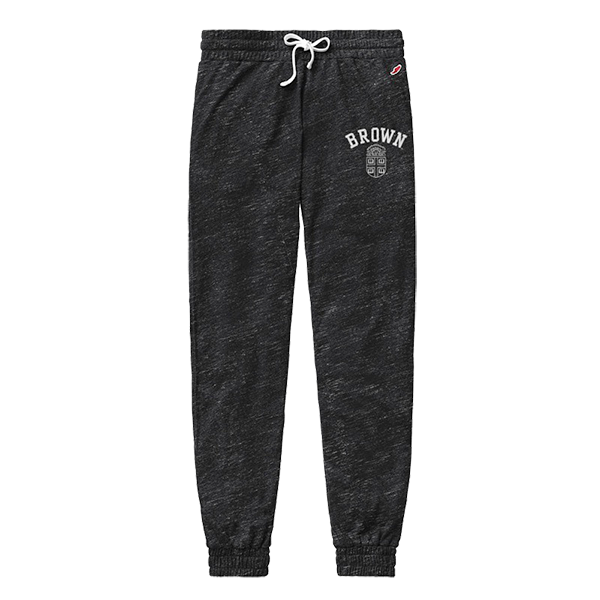 Champion 97% polyester, 3% cotton, wide-elastic waistband with black drawstring, black mesh cropped, above the ankle, women's sweatpants with side pockets. Cardinal and white Crest next to 'BROWN' imprinted in white on upper-left side (see 2nd image for full graphic). Please select option for Champion Black Mesh Women's Cropped Sweatpants - $39.99. 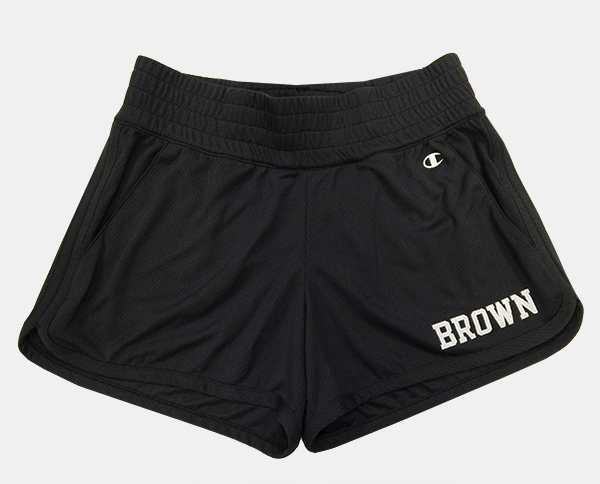 Champion 100% polyester, extra-wide elastic waistband, black mesh women's running shorts with side pockets. Champion symbol imprinted in silver on upper-left and 'BROWN' imprinted in white on lower-left. 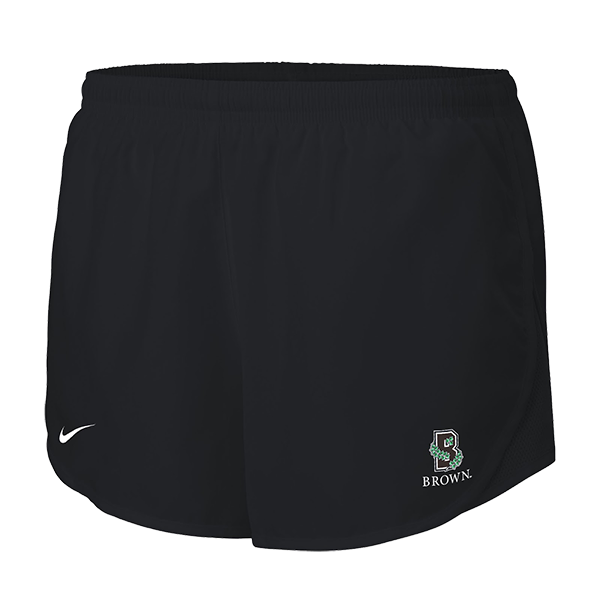 Please select option for Champion Black Mesh Women's Running Shorts - $29.99. 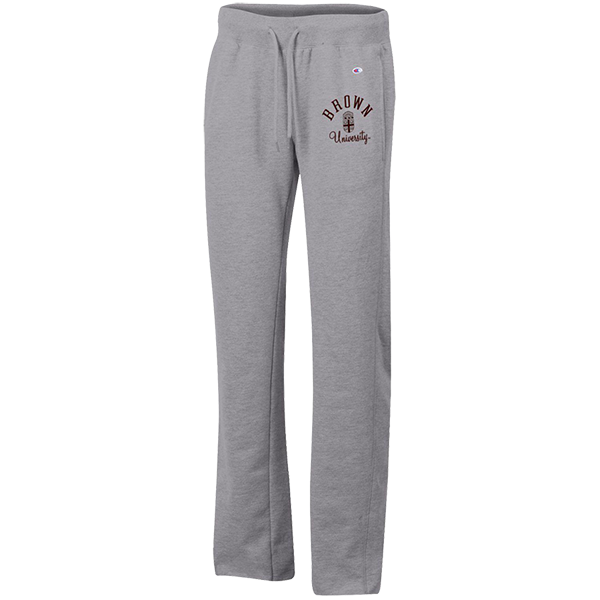 Champion 50% cotton, 50% polyester, wide-elastic waistband, charcoal women's sweatpants with ribbed cuffs at end of legs and side pockets. Cardinal, black, and white Crest above 'BROWN' in white outlined letters with cardinal drop-shadow running down left leg above white line above 'UNIVERSITY' in cardinal on left leg. 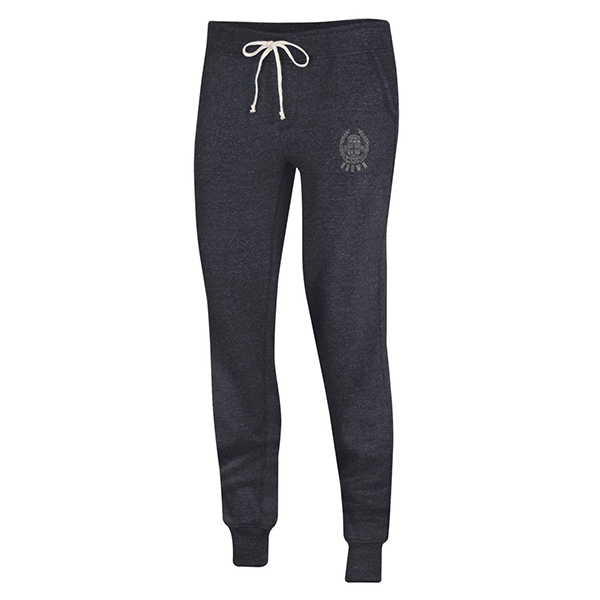 Please select option for Champion Charcoal Crest Women's Sweatpants - $39.99. 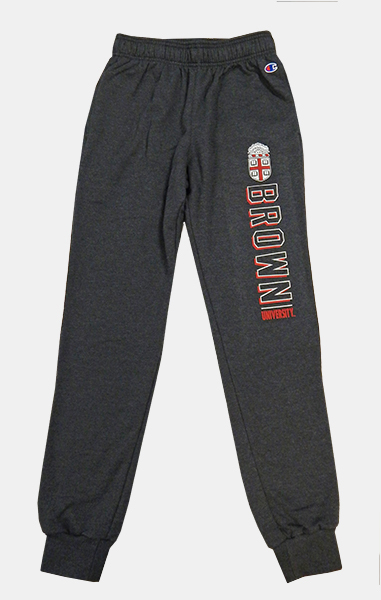 Champion 97% polyester, 3% cotton, wide-elastic waistband with grey drawstring, grey mesh cropped, above the ankle, women's sweatpants with side pockets. 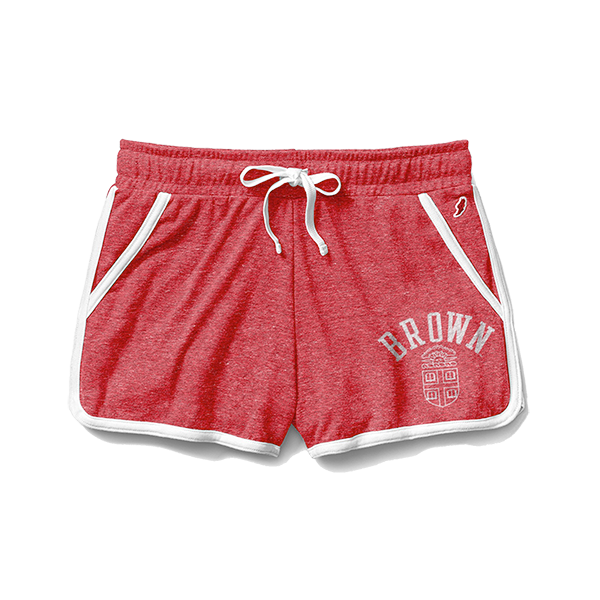 'BROWN' imprinted in cardinal with white outline above cardinal and white Crest above 'University' in white script on upper-left leg. 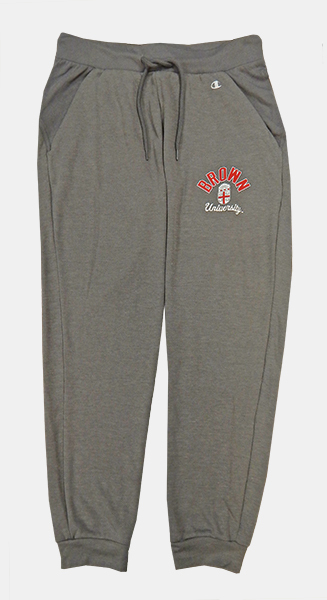 Please select option for Champion Grey Mesh Women's Cropped Sweatpants - $39.99. Please select option for Champion Women's University Pants. Please select option for League Clothes Line Cotton Shorts - Ash Grey. 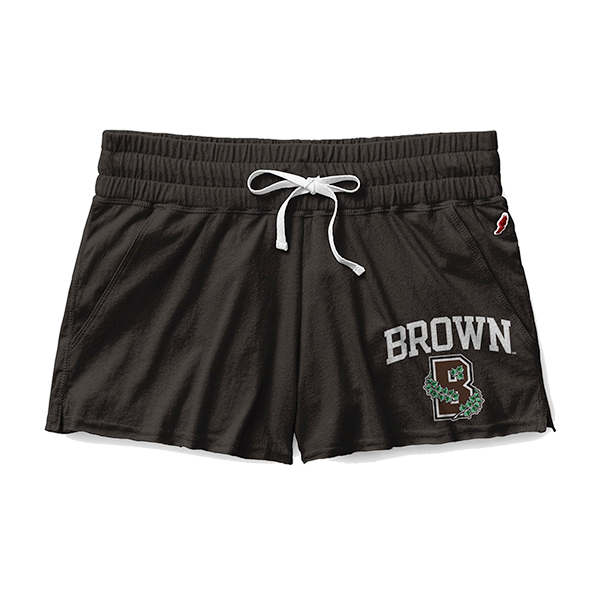 Please select option for League Clothes Line Cotton Shorts - Black. 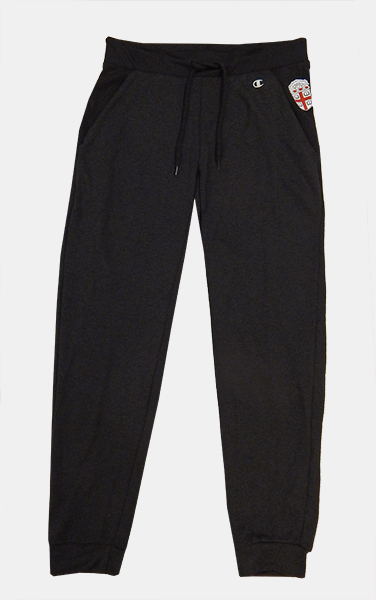 Please select option for League Intramural Jogger Pants - Black. 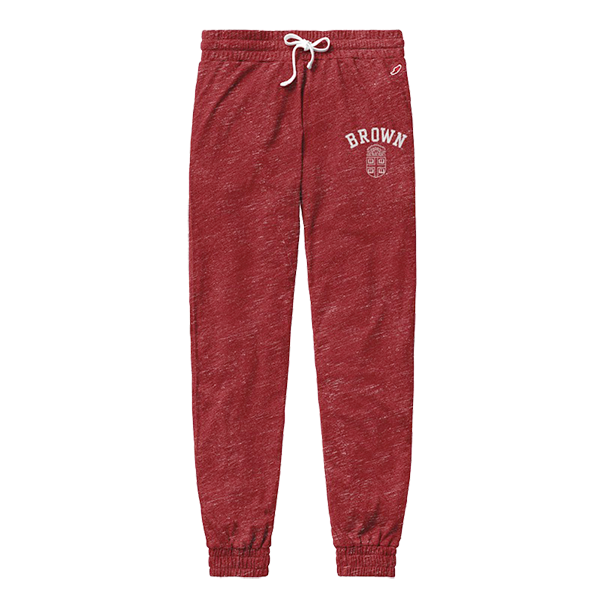 Please select option for League Intramural Jogger Pants - Red. Please select option for League Phys. Ed. Shorts - Red. 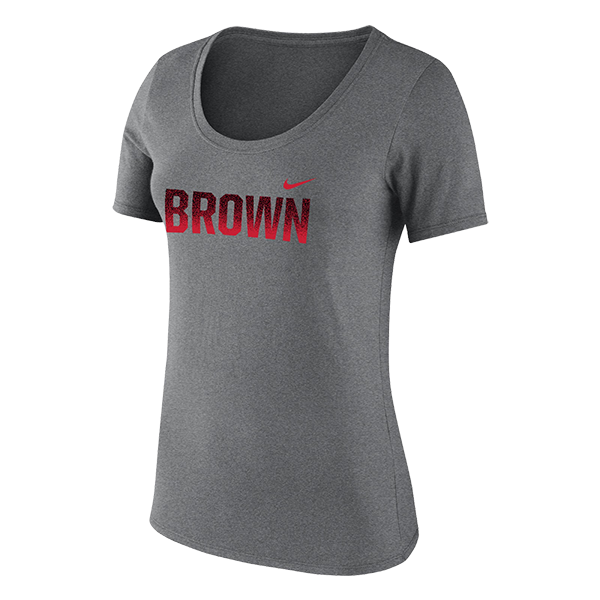 Under Armour heatgear, fitted, 58% cotton, 32% polyester, 10% elastane, wide-elastic waistband, black women's leggings with 'Brown' imprinted in large script down left leg. Please select option for Under Armour Black Script Women's Leggings - $57.99. Under Armour heatgear, loose-fit, 100% polyester, lined black women's running shorts with mesh side panels, inner key pocket, and side pockets. UA symbol imprinted in reflective grey on lower-right leg. 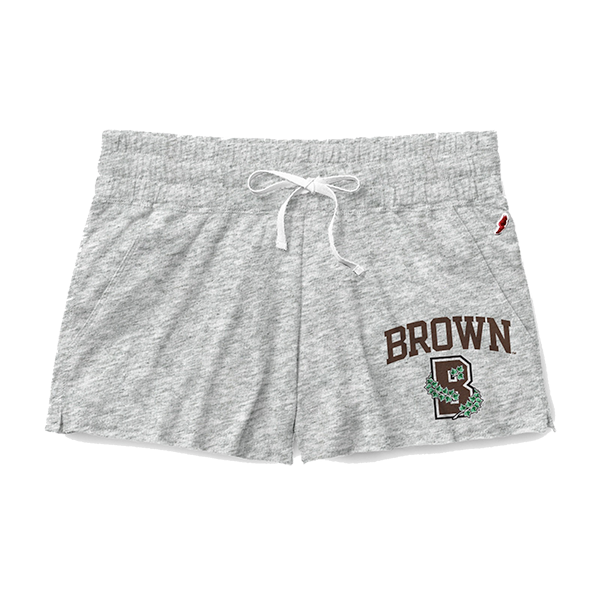 'BROWN' imprinted in white above 'UNIVERSITY' in white on lower-left leg. Please select option for Under Armour Black Univ. 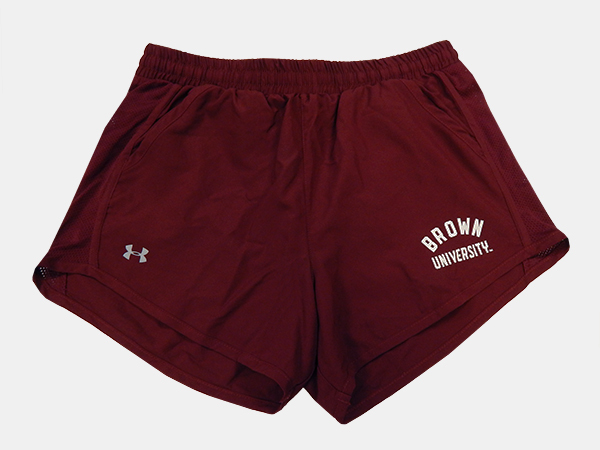 Women's Running Shorts - $42.99. Under Armour heatgear, loose-fit, 100% polyester, wide-elastic drawstring waistband, cardinal women's running shorts with mesh inserts on sides, grey inner lining, side mesh pockets, and inner key pocket. 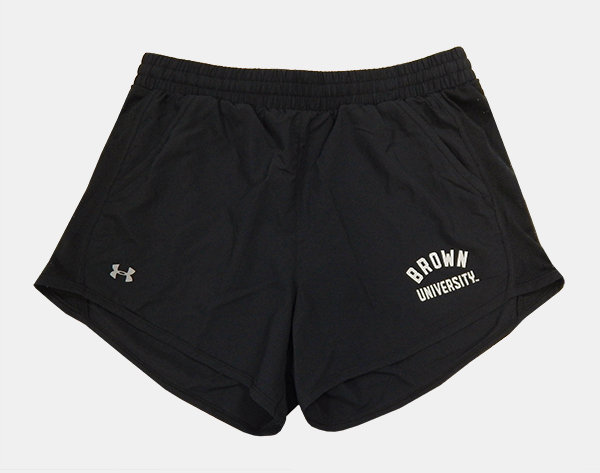 UA symbol imprinted in grey on lower-right leg; 'BROWN' imprinted in white above 'UNIVERSITY' in white on lower-left leg. Please select option for Under Armour Cardinal Women's Running Shorts - $42.99.